Installing faucet aerators and low-flow shower heads is one of the most effective water conservation methods you can use for your home or office. These fixtures are required for Green Business applicants. For lavatory faucets, the aerator flow rate must be 0.5 gpm or less. For kitchen faucets (except in fill sinks) and shower heads, the flow rate must be 1.5 gpm or less. Faucet Aerators: Standard aerators are devices that are designed to reduce the flow of the water coming out of the faucet while introducing air into the water flow. That is why they are called “aerators”. Water has to pass through very small holes and spreads out to cover more surface. If an aerator is already installed on your faucet, it will usually have its rated flow (in gallons per minute or gpm) imprinted on the side. If there appears to be an aerator installed, but there is no flow rate stamped on the side, the aerator may not be a low flow type and should be replaced with a new one. If no aerator is visible, check to see if there are threads just inside the tip of the faucet. 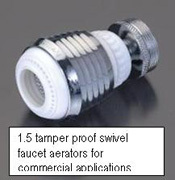 Most modern faucets are threaded to accept aerators. Some designer faucets have an internal built in “laminar” restrictor. Laminar restrictors work differently than standard faucet aerators by producing dozens of parallel streams of water. You can ask the manufacturer for the flow rate of these faucets or Green Business Program staff can help you measure the flow rate of your unstamped faucet aerators. If your faucets are not threaded for aerators, installing flow control valves or flow regulator devices are the best option for reducing flow rates since the flow can be varied to fit the function. Located under the sink, flow control valves go undetected by the faucet user. They cost about $20 a pair, pricing reduces with bulk purchasing. If your aerators keep suddenly disappearing, tamper proof aerators are a great alternative. Inexpensive and simple to install, low-flow shower heads and faucet aerators can reduce water consumption and also energy cost associated with heating water by as much as 50%.